A terrible tragedy has taken place just outside New York City. A young man murdered his father and then went stark raving mad. Sherlock Holmes is called upon by the lad’s mother to solve the crime. So Sherlock Holmes and Dr. Watson make their way to America. There they meet the villains of Tammany Hall and maybe – no one will ever know – a ghostly apparition the haunts the pleasant glade known as Sleepy Hollow. 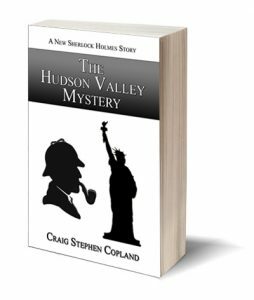 The story is inspired by “The Buscombe Valley Mystery,” one of the original stories in the canon of Sherlock Holmes. The unique characters of those stories are all still there present. The events and the setting may be new, but Sherlockians everywhere will recognize the mind and actions of the world’s most beloved detective.